Until September this year, I only thought about digital technologies in simple, practical terms: do I want it, do I need it, can I afford it, will it make some part, any part, of my life easier, better, or more fun. And I have found answers to those questions relatively easily, although at times not without frustration. I have decided against some technologies not necessarily because of the technology itself, but because of the terms under which I would be allowed to use it. Others I have chosen to use gladly, fully appreciating the benefits they bring to my work or personal life. Then, as part of the “Awakening the Digital Imagination” seminar series, I started reading scholarly articles and book excerpts about different aspects of digital technologies and their ever-increasing role in our lives and education, and engaging in discussions with a somewhat random (but thoughtfully assembled) group of people whose different perspectives have challenged many of my pervious assumptions. Or prompted me to contemplate questions I have never given any thought to before. Now I have a bunch of notes, quotes, questions and unfinished thoughts, some on pieces of paper floating around in my house, in my car, or on my desk at work; some in emails; some scribbled (in pencil, of course) on the margins of our book, or on printed versions of the articles. I need to make sense of them somehow, internalize them further, digest them, to crystalize and organize the thought fragments that are swirling around in my head. But I don’t have time. It is only very recently that the ability to forget has become a prized skill. Our cultural concept of education and knowledge is based upon the idea of building something up from a ground, from zero, and starting piece by piece to put things together, to construct edifices. […] Scientists always marvel at nature, at how it seems to be some grand code, with a built-in sense of purpose. Discoveries are made which reveal that more and more things are related, connected. Everything appears to be aware of itself and everything else, all fitting into an interlocking whole. If the criminal appears as a nonconformist who is unable to meet the demand of technology that we behave in uniform and continuous patterns, literate man is quite inclined to see others who cannot conform as somewhat pathetic. Happy birthday to the author I’ve studied and delighted over for the last thirty-three years: John Milton, born 1608. Happy birthday wishes also go out to Rear Admiral Grace Hopper, the mother of COBOL, a fountain of wit and wisdom, and a pioneering genius of computer science. I first learned about Admiral Hopper from Dr. David Evans’ Udacity course CS101. (Yes, Udacity. It just goes to show.) Dr. Evans linked to her famous interview with David Letterman, and I was an instant fan. 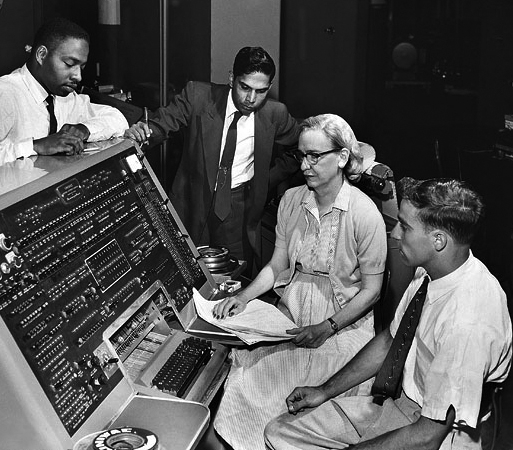 “Grace Murray Hopper at the UNIVAC keyboard, c. 1960.” From Wikipedia. The anniversary: 45 years ago today, Dr. Douglas Engelbart sat on a stage in San Francisco and, according to one awestruck observer, “dealt lightning with both hands.” The event has come to be known as “the mother of all demos.” There’s a very nice remembrance of Doug and his demo in The Atlantic today. I know there’s also a memorial happening right about now in San Jose, as his daughter Christina and many of Doug’s family, friends, and admirers are gathered to remember the demo and Doug, who passed away this year on July 5. I talked to Doug for about an hour, back in 2006. I met him and shook his hand in 2008 on the night before the 40th anniversary of the mother of all demos. I am humbled to be working with Christina on a project for this summer and beyond. I am so very grateful to be linked in spirit and work with Doug’s vision. When there are dark or confusing days, I try to remember how lucky I am to have found that vision, and to have thanked that visionary, while he was still with us. Phillip’s work is a conceptual mashup of Doug’s demo and Michael Wesch’s “The Machine Is Us/ing Us.” Even four years later, Phillip’s work still dazzles. Apparently Doug himself saw it at one point, which makes me very joyful. I write these words from a hotel room in Atlanta, where I’m attending the annual meeting of the Southern Association of Colleges and Schools Commission on Colleges. I’ve heard some inspiring speakers and learned a great deal about more of the vast machinery of higher education. At the same time, I’ve seen many folks whose eyes are on fire with a passionate devotion to learning and teaching. I honor them, and salute their survival despite the vast machinery that exists, in part and sometimes ironically, to support them and their vocations. Similarly, when I hear another presenter say “we didn’t know technology would eliminate jobs the way it has,” then offer a list of “technology improvements” for the organization that include new computers and monitors, new office software, etc., I have to gnash my teeth (quietly, but still). How can we be in 2013 and still be so far removed from even the outer edges of the bright light shed by the visions of Hopper and Engelbart, among many others? How can we call ourselves educators and be content not only to remain in darkness, but to spread it through inaction and (I’m sorry, but it must be said) ignorance? If, in your office, you as an intellectual worker were supplied with a computer display backed up by a computer that was alive for you all day and was instantly responsive to every action you had, how much value could you derive from that? Both Murray’s and Engelbart’s questions remain unanswered, and that itself is worth lamenting. The real grief comes, for me, because the questions are almost never asked, even among those who pride themselves on the arts of inquiry. A sad case, but there is still hope. My students have taught me that. Very salutary readings for a rainy Sunday morning at the SACS-COC conference in Atlanta, Georgia. This is the first time I’ve attended this annual meeting. Higher education is my vocation, so you wouldn’t think I’d have culture shock here–but I find I do. Perhaps that’s a first-timer’s gift. I must practice gratitude! Here are some of Merton’s thoughts. These come from a man who had been educated in France, England (graduating from Cambridge), and the US (graduating with an MA from Columbia University). For a short time, he was a professor of English at St. Bonaventure. So he knows whereof he speaks. So, what am I missing? A couple of the readings I’ve found insightful (Message is the Medium and this week’s reading come to mind), but other than nostalgia and, “gee, they were forward (or backward) thinkers back then,” what was I supposed to gain from reading about 40-60 year old technology and 40-60 year old technological thought? BTW… I’ve found our discussions enlightening and enjoyable. I look forward to them every week. But mostly our discussions have not been on the readings. Maybe that’s the point? I just wonder what we could have been reading, that would have been more relevant. Or, again, am I missing the point? So, here are a few snaps of the resulting work. In the first image you see a student experimenting with the machine, allowing the clamped frame to loosen the styrene, and as the heat softens the material it sags and pulls away from the frame. As it cools it retains that shape. The following two images are sample pieces from the studio, after cutting and shaping. Due to some weird feed issues, all my posts are going to a “mother blog” associated with the new media seminar I’m participating in this semester. So, the posts I have lined up here I’ve rescheduled to post after the seminar has completed. More on the research agenda (and other library related issues) then! In a conversation the other day someone asked whether the fundamental way people learn has changed. The idea was that constant exposure to multi-tasking, new child rearing philosophies, and the rapid emergence of new technologies has created a perfect storm that has fundamentally changed the way that children grow up and learn. My initial reaction was to think of a different question, which is whether we now value different skills, and our perceptions are therefore skewed towards our ability (or lack thereof) to cultivate those skills. Sherry Turkle, in ‘Video Games and Computer Holding Power’, showed that the boy who constituted her case study, Jarish, was so interested in video games that he was motivated to learn physics so that he could appropriately code the actions of a ball in a video game. This is, essentially, an interest in applied knowledge. This interest isn’t a fundamentally different way of learning, but I think we often conflate the two in our present-day discussions of technology in education. What Jarish implied he wanted through his longing was a different way of contextualizing content for the purpose of developing particular skills. At a higher level, we could call this motivating students through biasing content to their interests. Nothing wrong with that at all, and it is a nice portrait of human psychology and the narcissism that Turkle also discusses in her piece. Her focus, of course, is more on the way in which we can become so besotted with computers that we lose ourselves, but thinking back on that conversation about human learning made a connection between the two for me – we’re motivated by seeing that perfect reflection of ourselves, so logically we’d be most motivated to learn that which best reflected ourselves. I don’t think I’d consider that new, but I think our ways of productively harnessing that narcissism have improved. 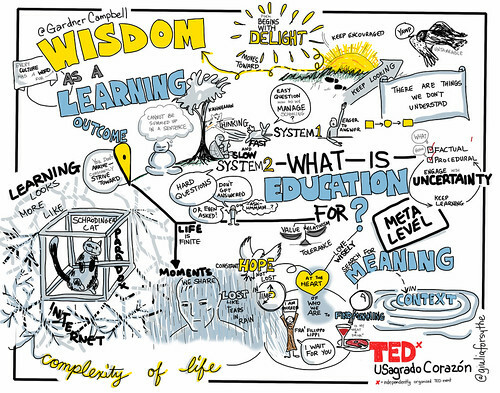 So, when we talk about problem-based learning, flipping the classroom, teaching with technology, MOOCs, or any other kind of “of the moment” educational trend, I’d argue that we’re not really talking about a fundamental restructuring of learning but of better catering to inherent human narcissism to improve a particular set of outcomes we presently value. Make the topic matter to the student, and the student is more likely to retain whatever it is we’re aiming for. Will be interested to hear where this piece led others in our seminar. I’ve been mulling over this next post for far too long, and the results will be brief and rushed (such bad food, and such small portions!). You have been warned. 1. The computer is “just a tool.” This part’s in partial response to the comments on my previous post. 2. Doug Engelbart’s “Augmenting Human Intellect: A Conceptual Framework” is “difficult to understand” or “poorly written.” This one’s a perpetual reply. It was most recently triggered by an especially perplexing Twitter exchange shared with me by Jon Becker. 3. I don’t think this activity increases efficiency, if efficiency means “getting more done in less time.” (A “cognitive Taylorism,” as one seminarian put it.) More what is always the question. For me, Engelbart’s transcontextual gifts (and I’ll concede that there are likely transcontextual confusions in there too–it’s the price of trancontextualism, clearly) are such that the emphasis lands squarely on effectiveness, which in his essay means more work with positive potential (understanding there’s some disagreement but not total disagreement about what “positive” means). It’s an attempt to tell more of the the whole truth about experience, and to build a better world out of those double takes. Together. Is Engelbart’s essay a flawless attempt? Of course not. But for me, Bateson’s idea of transcontextualism helps to explain the character of the attempt, and to indicate how brave and necessary it is, especially within a world we can and must (and do, yet often willy nilly) build together.